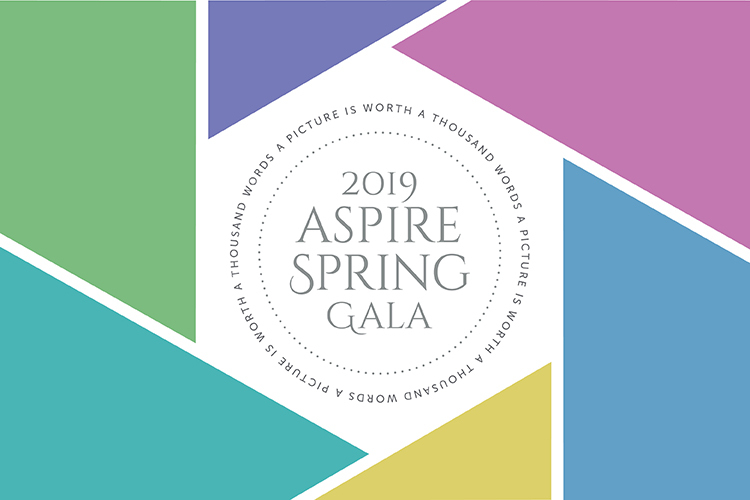 Thank you for joining us for the Aspire Spring Gala on Thursday, April 4, 2019. Aspire helps children, teens and adults with high cognitive autism spectrum disorder and related profiles develop the skills necessary to be successful in their communities and workplaces. Your support enables Aspire to expand its internship program, provide financial aid to participants in need, and launch new programs to support young people on the autism spectrum. To learn more about Aspire, please visit the Aspire program’s web site. 2019 Aspire Spring Gala Video: People Matter. Moments Matter. Aspire is a highly successful, therapeutically-based program that serves children, teens and adults with high cognitive autism spectrum disorder and related social profiles. Additionally, the program supports more than 15 area school districts and conducts workshops serving 700 education and private sector professionals each year. Aspire works to develop participants’ social skills and help them develop greater independence. Individuals on the autism spectrum often have difficulties in the areas of social skills, communication, academic achievement, sensory integration and behavioral regulation. The Aspire approach teaches social and life skills using the 3 S’s approach: Social competency, self-awareness, and stress management. This approach not only allows staff to provide individualized coaching and support “in the moment,” but also ensures an ideal environment for participants to learn new skills. At Aspire, we work to help individuals on the autism spectrum achieve their full potential in all aspects of their lives and are committed to serving participants regardless of their economic background. Aspire offers a fun-filled seven-week day camp for children entering first grade through age 15. Designed to model the traditional “summer camp experience,” each camp day consists of recreational activities as well as therapeutic interventions. Social Thinking Groups (ages 5-30)Aspire offers social skills groups throughout the year that focus on social success for our participants using the 3S approach in carefully matched small-group environments. Themed Activity Groups (ages 5-30)Themed activity groups are based on a particular need of our participants or inspired by areas or activities of interest that bring like-minded individuals together. Participants acquire skills in such areas as executive functioning, wellness, stress and coping. Examples include cooking, games and creative arts. Excursions and Explorations (ages 13-22)Explorations and Excursions offers youth the opportunity to develop and practice daily living and social skills. Participants take part in field trips, team building and social activities aimed at practicing social skills during regular everyday experiences. Adult Groups (ages 18-30)Adult groups offer the opportunity to learn social communication skills for living independently, navigating college, turning interests into gainful employment, engaging successfully in a workplace and more. Groups focus on the development of self-awareness, social thinking and executive function and life skills in a supportive and structured setting with peers. Internship Program (ages 18-30)The Aspire Internship Program is a unique program designed to help adults with high cognitive autism spectrum disorder and related social profiles navigate the various aspects of a work environment while gaining important on-the-job skills. A key feature of this program is the Aspire Career Counselor, who helps participants transition into their internship placements and learn about the social interactions needed to succeed in the workplace. Consultation and Professional Development ServicesAspire works with public school systems, colleges and universities, agencies and clinical providers to equip these professionals with the skills they need to meet the diverse and complex needs of individuals with social, neurological, learning and behavioral challenges. Introducing Our Aspirational and Visionary Sponsors! CCC, together with its affiliates, provides cross-industry solutions to support the vehicle lifecycle. Founded in 1980, CCC’s solutions and big data insights are delivered through the CCC ONE™ platform to a vibrant network of 350+ insurance companies, 24,000+ repair facilities, OEMs, hundreds of parts suppliers, and dozens of third-party data and service providers. Annually, over 24 million estimates and 16 million repairs are processed on CCC’s products and services, and CCC also provides access to car-related services for millions of consumers via carwise.com. Additionally, Auto Injury Solutions Inc. – a CCC company – provides customizable, end-to-end, casualty solutions to auto insurers for the handling of first and third-party claims. The collective set of CCC’s solutions inform decision-making, enhance productivity, and help customers deliver faster and better experiences for end consumers. Learn more about CCC at cccis.com. Copart, Inc., founded in 1982, is a global leader in online vehicle auctions. Copart’s innovative technology and online auction platform links sellers to more than 750,000 Members in over 170 countries. The company offers services to process and sell salvage and clean title vehicles to dealers, dismantlers, rebuilders, exporters and, in some cases, to end users. Copart sells vehicles on behalf of insurance companies, banks, finance companies, charities, fleet operators, dealers, and individual owners. With operations at over 200 locations in 11 countries, Copart has more than 125,000 vehicles available online every day. Enterprise Rent-A-Car is an ongoing American success story. Our guiding principles, and humble beginning, revolve around personal honesty and integrity. We believe in strengthening our communities one neighborhood at a time, serving our customers as if they were our family, and rewarding hard work. These things are as true today as they were when we were founded in 1957.Today, our massive network means Enterprise is the largest transportation solutions provider. Beyond traditional car and truck rental our mobility offering expands to car sharing, ride sharing, car sales and fleet management. We’re in over 85 countries with more than 7,600 locations. What does this mean to our customers? We’re there when you need us, with award-winning customer service. Whether you need a replacement vehicle, a ride to work or a weekend getaway- Enterprise is the one place to go for all of the places life takes you. ExamWorks Group is a leading provider of independent medical examinations (IME), peer reviews, bill reviews, Medicare compliance, case management, record retrieval, document management, and related services. Clients use independent medical review services to confirm the veracity of claims by sick or injured individuals. We help our clients in the U.S., Canada, the United Kingdom, and Australia manage costs and enhance their risk management processes by verifying the validity of claims, identifying fraud and providing fast, efficient and quality IME services. We provide IME services through our medical panel of credentialed physicians and allied medical professionals. Custom portals, applications, workflow enhancements and systems integration are part and parcel of our service. With a talented team of more than 3,300 employees, IAA is committed to providing customers with the highest level of service in the industry. We place special emphasis on nurturing strategic partnerships and transforming our product offering to be much more than a salvage auction. From our line of Total Loss Solutions products that help speed up the claim settlement process to developing a global marketplace that connects buyers to the right vehicles to leveraging our business model to turn donated vehicles into funding for charities, IAA is always innovating to provide comprehensive service solutions. Liberty Mutual’s purpose is to help people embrace today and confidently pursue tomorrow. The promise we make to our customers throughout the world is to provide protection for the unexpected, delivered with care. In business since 1912, and headquartered in Boston, Mass., today we are the fifth largest global property and casualty insurer based on 2017 gross written premium. We also rank 68th on the Fortune 100 list of largest corporations in the U.S. based on 2017 revenue. As of December 31, 2018, we had $41.6 billion in annual consolidated revenue.We employ nearly 50,000 people in 30 countries and economies around the world. We offer a wide range of insurance products and services, including personal automobile, homeowners, specialty lines, reinsurance, commercial multiple-peril, workers compensation, commercial automobile, general liability, surety, and commercial property. You can learn more about us by visiting www.libertymutualinsurance.com. MES Solutions (MES) is a management service organization that provides the claims community access to credentialed physicians with expertise in conducting evidenced-based independent medical exams and peer reviews. Insurance lines served include auto, disability, liability, and workers’ compensation as well as well as pharmacy benefit management. MES is HITRUST and URAC accredited and completes a SOC 2 ®Type II audit annually. MES offers it services throughout the U.S. through 14 regional service centers. The Peer Review and Disability Services units are located in Norwood, Massachusetts and Saddle Brook, New Jersey respectively. MES, founded in 1978, is headquartered in Woburn. Massachusetts. With more than 7,800 MobileGlassShops™ and stores in all 50 states, Safelite AutoGlass® is the nation’s largest provider of vehicle glass repair, replacement, and calibration services. Yet at the foundation of our business is the power of a caring heart—fueled by our nearly 15,000 associates who are committed to bettering the lives of children and families in the communities where they live and work. That dedication, and our People Powered, Customer Driven approach to every day at Safelite, nicely positions us as a trusted expert to our customers. It all comes down to our purpose and why we exist: to bring unexpected happiness to people’s everyday lives. We’re proud of that. We’re Safelite. Worley was formed in 1976 to serve the needs of insurance industry clients. With office locations throughout the country Worley specializes in first party property and auto claims, third party administration, staffing solutions and managed repair services. Worley has evolved into one of the largest and most diverse claims service providers in the United States and is recognized for its quality service, customizable solutions and professionalism.